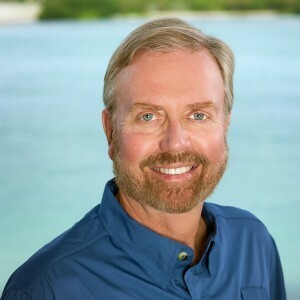 Dr. Robert E. Hueter is a Senior Scientist and Director of the Center for Shark Research at Mote Marine Laboratory in Sarasota, Florida, where he also occupies the Perry W. Gilbert Chair in Shark Research. The Mote CSR is a national research center established by the U.S. Congress in 1991, to conduct research and outreach on diverse aspects of shark biology ranging from biomedical applications for human health to shark ecology, fisheries and conservation. Dr. Hueter has been a marine biologist for more than 40 years, has published about 200 scientific articles and reports on sharks, and has edited six volumes on shark biology. His current research includes field and laboratory studies of shark abundance, behavior, ecology and fisheries in the northwest Atlantic Ocean, Gulf of Mexico and Caribbean Sea, including in Mexico and Cuba. He has studied hundreds of shark species including blacktip, bull, great hammerhead, whale, mako and white sharks. In 2004, Dr. Hueter was selected by Florida Trend magazine as one of Florida’s most influential people, in 2007 he was recognized with a Lifetime Achievement Award in Conservation by Sarasota County, Florida, and in 2008 he was awarded the Eugenie Clark Scientific Explorers Award. Dr. Hueter earned his Bachelor's and Master's degrees from the University of Miami and his Ph.D. from the University of Florida. He is Past-President of the American Elasmobranch Society and currently serves on the AES Board of Directors. For the past 20 years Dr. Hueter has served on the Highly Migratory Species Advisory Panel of the U.S. National Marine Fisheries Service and has testified before the U.S. Congress on issues relating to shark fisheries management and conservation. He also serves as the Chief Science Advisor for OCEARCH, a nonprofit organization dedicated to innovative ocean research and education. In addition to his research activities, Dr. Hueter has led educational efforts to promote better public understanding of sharks as a marine resource, through numerous interviews in national publications and hundreds of television and radio appearances. He has been a leader in science-based conservation of sharks since 1988, and today is an internationally recognized proponent of sustainable shark fishing practices in commercial and recreational fisheries. Much of his current work involves marine science policy as a diplomatic bridge between nations for the betterment of shared environments and human populations. 2018. Bedore, C.N., Hueter, R.E., Johnsen, S. Visual Ecology of the White Shark and Shortfin Mako. Integr. Comp. Biol., 58, E15-E15. 2017. Norman, B. et al. (38 authors incl. R. Hueter). Biology of an endangered marine megavertebrate further informed through citizen science. BioScience 67:1029-1043. 2017. Whitney, N.M., C.F. White, P.A. Anderson, R.E. Hueter and G.B. Skomal. The physiological stress response, postrelease behavior, and mortality of blacktip sharks (Carcharhinus limbatus) caught on circle and J-hooks in the Florida recreational fishery. Fishery Bulletin 115:532–543. 2017. Shiffman, D.S. and R.E. Hueter. A United States shark fin ban would undermine sustainable shark fisheries. Marine Policy 85:138-140. 2017. Smith, M., D. Warmolts, D. Thoney R. Hueter, M. Murray and J. Ezcurra (eds.). The Elasmobranch Husbandry Manual II: Recent Advances in the Care of Sharks, Rays and their Relatives. Special Publ., Ohio Biological Survey:xi+482pp. 2017. Bennett, R., S. Kaiser, R. Selvan, R. Hueter, J. Tyminski and P. Lotter. The rescue, rehabilitation and release of a whale shark (Rhincodon typus) in the Arabian Gulf. In Smith, M., D. Warmolts, D. Thoney R. Hueter, M. Murray and J. Ezcurra (eds.). The Elasmobranch Husbandry Manual II: Recent Advances in the Care of Sharks, Rays and their Relatives. Special Publ., Ohio Biological Survey:229-235. 2017. Gardiner, J.M., J. Atema, R.E. Hueter and P.J. Motta. Modulation of shark prey capture kinematics in response to sensory deprivation. Zoology 120C:42-52. 2017. Lear, K.O., N.M. Whitney, L.R. Brewster, J.J. Morris, R.E. Hueter and A.C. Gleiss. Correlations of metabolic rate and body acceleration in three species of coastal sharks under contrasting temperature regimes. Journal of Experimental Biology 220:397-407. 2016. Flowers, K.I., M.J. Ajemian, K. Bassos-Hull, K.A. Feldheim, R.E. Hueter, Y.P. Papastamatiou and D.D. Chapman. A review of batoid philopatry, with implications for future research and population management. Marine Ecology Progress Series 562:251-261. 2016. Whitney, N.M., C.F. White, A.C. Gleiss, G.D. Schwieterman, P. Anderson, R.E. Hueter and G.B. Skomal. A novel method for determining post-release mortality, behavior, and recovery period using acceleration data loggers. Fisheries Research 183:210-221. 2015. Tyminski, J.P., R. de la Parra-Venegas, J. Gonzalez Cano and R.E. Hueter. Vertical movements and patterns in diving behavior of whale sharks as revealed by pop-up satellite tags in the eastern Gulf of Mexico. PLoS ONE10(11):e0142156. doi:10.1371/journal.pone.0142156. 2015. Gardiner, J.M., N.M. Whitney and R.E. Hueter. Smells like home: the role of olfactory cues in the homing behavior of blacktip sharks, Carcharhinus limbatus. Integrative and Comparative Biology doi:10.1093/icb/icv087. 2015. Mara, K.R., P.J. Motta, A.P. Martin and R.E. Hueter. Constructional morphology within the head of hammerhead sharks (Sphyrnidae). Journal of Morphology 276:526-539, DOI: 10.1002/ jmor.20362. 2015. Sellas, A.B., K. Bassos-Hull, J.C. Perez-Jimenez, J.A. Angulo-Valdes, M.A. Bernal and R.E. Hueter. Population structure and seasonal migration of the spotted eagle ray, Aetobatus narinari. Journal of Heredity doi: 10.1093/jhered/esv011. 2014. Chapman, D.D., K. Feldheim, Y. Papastamatiou and R.E. Hueter. There and back again: a review of residency and return migrations in sharks, with implications for population structure and management. Annual Review of Marine Science 7:547-570. 2014. Hsu, H.H., S.J. Joung, R.E. Hueter and K.M. Liu. Age and growth of the whale shark Rhincodon typus in the north-western Pacific. Marine and Freshwater Research DOI 10.1071/MF13330. 2014. Lang, A.W., M.T. Bradshaw, J.A. Smith, J.N. Wheelus, P.J. Motta, M.L. Habegger and R.E. Hueter. Movable shark scales act as a passive dynamic micro-roughness to control flow separation. Bioinspiration & Biomimetics 9:036017(10pp), DOI 10.1088/1748-3182/9/3/036017. 2014. Clingham, E., J. Brown, A. Dove, J. Tyminski and R. Hueter. Observations and first tagging of whale sharks off St. Helena in the south Atlantic. 30th Annual Meeting of the American Elasmobranch Society / Joint Meeting of Ichthyologists & Herpetologists, Chattanooga, Tennessee. 2014. Bassos-Hull, K., K.A. Wilkinson, P.T. Hull, D.A. Dougherty, K.L. Omori, L.E. Ailloud, J.J. Morris and R.E. Hueter. Life history and seasonal occurrence of the spotted eagle ray, Aetobatus narinari, in the eastern Gulf of Mexico. Environmental Biology of Fishes 97:1039–1056. 2014. Aguilar, C., G. González-Sansón, R. Hueter, E. Rojas, Y. Cabrera, A. Briones, R. Borroto, A. Hernández and P. Baker. Captura de tiburones en la región noroccidental de Cuba. Latin American Journal of Aquatic Research 42:477-487. 2014. Gardiner, J.M., J. Atema, R.E. Hueter and P.J. Motta. Multisensory integration and behavioral plasticity in sharks from different ecological niches. PLoS ONE 9(4):e93036. 2013. Hueter, R.E., J.P. Tyminski and R. de la Parra. Movements and demographics of whale sharks in the Gulf of Mexico and northwestern Caribbean Sea. 3rd International Whale Shark Conference, Atlanta, Georgia. 2013. Tyminski, J.P., R.E. Hueter and R. de la Parra. Vertical movements and patterns in diving behavior of whale sharks identified through pop-up satellite tagging off the Yucatan Peninsula, Mexico. 3rd International Whale Shark Conference, Atlanta, Georgia. 2013. Hueter, R.E., J.P. Tyminski and S. Kaiser. Movement of a satellite-tagged whale shark in the Arabian Gulf after rescue and rehabilitation in captivity. 3rd International Whale Shark Conference, Atlanta, Georgia. 2013. Hueter, R.E., J.P. Tyminski and L. Villanueva. Issues and options for whale shark conservation in Gulf of Mexico and western Caribbean waters of the U.S., Mexico and Cuba. 3rd International Whale Shark Conference, Atlanta, Georgia. 2013. Bedore, C.N., E.R. Loew, T.M. Frank, R.E. Hueter, D.M. McComb and S.M. Kajiura. A physiological analysis of color vision in batoid elasmobranchs. Journal of Comparative Physiology A 199:1129-1141. 2013. Hueter, R.E., J.P. Tyminski and R. de la Parra. Horizontal movements, migration patterns, and population structure of whale sharks in the Gulf of Mexico and northwestern Caribbean Sea. PLoS ONE 8(8):e71883. 2013. Gardiner, J.M., J. Atema, R.E. Hueter and P.J. Motta. Sensory switching in sharks: the role of multimodal stimuli in prey tracking and capture. Integrative and Comparative Biology 53:E74. 2013. Neff, C. and R. Hueter. Science, policy, and the public discourse of shark “attack”: a proposal for reclassifying human-shark interactions. Journal of Environmental Studies and Sciences 3(1):65-73. DOI 10.1007/s13412-013-0107-2:9pp. 2013. Hueter, R., J. Tyminski, J. Morris and C. Aguilar Betancourt. Horizontal and vertical movements of a satellite-tagged longfin mako (Isurus paucus Guitart Manday, 1966) in the northwestern Atlantic Ocean. 29th Annual Meeting of the American Elasmobranch Society / Joint Meeting of Ichthyologists & Herpetologists, Albuquerque, New Mexico. 2013. Winkler, M., T. Yuen, G. Shoa, K. Svoboda, C.J. Murphy, R.E. Hueter, D.J. Brown, J.V. Jester. Collagen macrostructure and corneal shape: lessons from divergent species. Investigative Ophthalmology & Visual Science 54(6):e1641. 2012. Hueter, R.E. and J.P. Tyminski. Issues and options for whale shark conservation in Gulf of Mexico and western Caribbean waters of the U.S., Mexico and Cuba. Mote Marine Laboratory Tech. Rpt. 1633:43pp. 2012. Lang, A., P. Motta, M.L. Habegger and R. Hueter. Shark skin boundary layer control. In: Childress et al. (eds) Natural Locomotion in Fluids and on Surfaces IMA 155, DOI 10.1007/978-1-4614-3997-4 9. Springer Science+Business Media, New York. 2012. Motta, P., M.L. Habegger, A. Lang, R. Hueter and J. Davis. Scale morphology and flexibility in the shortfin mako Isurus oxyrinchus and the blacktip shark Carcharhinus limbatus. Journal of Morphology 273:1096-1110. 2012. G. Machlis, T.A. Frankovich, P.M. Alcolado, E. Garcia-Machado, A.C. Hernández-Zanuy, R.E. Hueter, N. Knowlton, E. Perera, and J.W. Tunnell. US-Cuba scientific collaboration: emerging issues and opportunities in marine and related environmental sciences. Oceanography 25:227–231. 2012. Gardiner, J.M., R.E. Hueter, K.P. Maruska, J.A. Sisneros, B.M. Casper, D.A. Mann and L.S. Demski. Sensory physiology and behavior of elasmobranchs. In: Carrier, J.C., Musick, J.A., and Heithaus, M.R. (eds) Biology of Sharks and Their Relatives, 2nd Edition:349-401. CRC Press, Boca Raton, FL. 2011. Lang, A., P. Motta, M.L. Habegger, R.E. Hueter and F. Afroz. Shark skin separation control mechanisms. Marine Technology Society Journal 45:208-215. 2011. Sellas, A.B., K. Bassos-Hull, R.E. Hueter and K.A. Feldheim. Isolation and characterization of polymorphic microsatellite markers from the spotted eagle ray (Aetobatus narinari). Conservation Genetics Resources 3:609–611. 2010. Motta, P.J., M. Maslanka, R.E. Hueter, R.L. Davis, R. de la Parra, S.L. Mulvany, M.L. Habegger, J.A. Strother, K.R.Mara, J.M. Gardiner, J.P. Tyminski and L.D. Zeigler. Feeding anatomy, filter-feeding rate, and diet of whale sharks Rhincodon typus during surface ram-filter feeding off the Yucatan Peninsula, Mexico. Zoology 113:199-212. 2010. McComb, D.M., T.M. Frank, R.E. Hueter and S. M. Kajiura. Temporal resolution and spectral sensitivity of the visual system of three coastal shark species from different light environments. Physiological and Biochemical Zoology 83:299-307. 2009. Bizzarro, J.J., W.D. Smith, J. Leonardo Castillo-Geniz, A. Ocampo-Torres, J. Fernando Marquez-Farias and R.E. Hueter. The seasonal importance of small coastal sharks and rays in the artisanal elasmobranch fishery of Sinaloa, Mexico. Pan-American Journal of Aquatic Sciences 4(4): 513-531. 2009. Bizzarro, J.J., W.D. Smith, R.E. Hueter and C.J. Villavicencio-Garayzar. Activities and catch composition of artisanal elasmobranch fishing sites on the eastern coast of Baja California Sur, Mexico. Bulletin of the Southern California Academy of Sciences 108:137-151. 2009. Bizzarro, J.J., Smith, W.D., Marquez-Farias, J. Tyminski and R.E. Hueter. Temporal variation in the artisanal elasmobranch fishery of Sonora, Mexico. Fisheries Research 97:103-117. 2008. Hueter, R., J. Tyminski and R. de la Parra. Deep diving and distant travels: vertical and horizontal movements of whale sharks (Rhincodon typus) tagged off Quintana Roo, Mexico. 24th Annual Meeting of the American Elasmobranch Society / Joint Meeting of Ichthyologists & Herpetologists, Montreal, Quebec, Canada. 2008. Hueter, R., J. Tyminski and R. de la Parra. The geographical movements of whale sharks tagged with pop-up archival satellite tags off Quintana Roo, Mexico. Proc. of 2nd International Whale Shark Conference, Holbox, Quintana Roo, Mexico, 15-20 July 2008. 2008. Tyminski, J., R. Hueter and R. de la Parra. The vertical movements of whale sharks tagged with pop-up archival satellite tags off Quintana Roo, Mexico. Proc. of 2nd International Whale Shark Conference, Holbox, Quintana Roo, Mexico, 15-20 July 2008. 2008. Motta, P.J., R.E. Hueter, T.C. Tricas, A.P. Summers, D.R. Huber, D. Lowry, K.R. Mara, M.P. Matott, L.B. Whitenack and A.P. Wintzer. Functional morphology of the feeding apparatus, feeding constraints, and suction performance in the nurse shark Ginglymostoma cirratum. Journal of Morphology 269:1041–1055. 2008. Hueter, R.E., and C.A. Simpfendorfer. Trends in blue shark abundance in the western North Atlantic as determined by a fishery-independent survey. In Sharks of the Open Ocean: Biology, Fisheries and Conservation (M.D. Camhi, E.K. Pikitch and E.A. Babcock, eds.). Blackwell Science Publ., Fish and Aquatic Resources Series 13:236-241. 2007. Hueter, R., G. Cailliet, J. Musick, G. Burgess, J. Tyminski, D. Ebert, D. Grubbs and C. Conrath. Highly migratory shark fisheries research by the National Shark Research Consortium, 2002- 2007. Mote Marine Laboratory Technical Report No. 1241:122p. 2007. Castro, A.L.F, B.S. Stewart, S.G. Wilson, R.E. Hueter, M.G. Meekan, P.J. Motta, B.W. Bowen and S.A. Karl. Population genetic structure of earth’s largest fish, the whale shark (Rhincodon typus). Molecular Ecology 16:5183-5192. 2007. Hueter, R., J. González-Cano, R. de la Parra, J. Tyminski, J. Perez-Ramírez and F. Remolina-Suarez. Biological studies of large feeding aggregations of whale sharks (Rhincodon typus) in the southern Gulf of Mexico. In The First International Whale Shark Conference: Promoting International Collaboration in Whale Shark Conservation, Science and Management (T.R. Irvine and J.K. Keesing, eds.). CSIRO Marine and Atmospheric Research, Australia, p 76. 2007. Hueter, R.E., J.P. Tyminski, C. Simpfendorfer, R. de la Parra and M. Trigo-Mendoza. Satellite-based tracking of whale sharks (Rhincodon typus) tagged off Quintana Roo, Mexico: movement patterns, hypotheses and challenges. 23rd Annual Meeting of the American Elasmobranch Society / Joint Meeting of Ichthyologists & Herpetologists, St. Louis, Missouri. 2007. Heithaus, M.R., D. Burkholder, R.E. Hueter, L.I. Heithaus, H.L. Pratt, Jr. and J.C. Carrier. Spatial and temporal variation in shark communities of the lower Florida Keys and evidence for historical population declines. Canadian Journal of Fisheries and Aquatic Sciences 64:1302-1313. 2007. Hueter, R.E., J.L. Castillo–Géniz, J.F. Márquez–Farias and J.P. Tyminski. The use of Laguna Yalahau, Quintana Roo, Mexico as a primary nursery for the blacktip shark. In Shark Nursery Grounds of the Gulf of Mexico and the East Coast Waters of the United States (C.T. McCandless, N.E. Kohler and H.L. Pratt, Jr., eds.). American Fisheries Society Symposium 50:345-364. 2007. Hueter, R.E. and J.P. Tyminski. Species-specific distribution and habitat characteristics of shark nurseries in Gulf of Mexico waters off peninsular Florida and Texas. In Shark Nursery Grounds of the Gulf of Mexico and the East Coast Waters of the United States (C.T. McCandless, N.E. Kohler and H.L. Pratt, Jr., eds.). American Fisheries Society Symposium 50:193-223. 2007. Tyminski, J.P., R.E. Hueter and A.J. Ubeda. Tag-recapture results of small coastal sharks Carcharhinus acronotus, C. isodon, Rhizoprionodon terraenovae, and Sphyrna tiburo) in the Gulf of Mexico. SEDAR 13-DW-36. 2007. Tyminski, J.P, A.J. Ubeda, R.E. Hueter and J. Morris. Relative abundance of blacknose sharks, Carcharhinus acronotus, from coastal shark surveys in the eastern Gulf of Mexico, 2001–2006. SEDAR 13-DW-37-V2. 2007. Ubeda A.J., J.P. Tyminski and R. E. Hueter. Relative abundance of bonnethead, Sphyrna tiburo, and Atlantic sharpnose sharks, Rhizoprionodon terraenovae, in two Florida Gulf estuaries, 1995-2004. SEDAR 13-DW-38-V2. 2007. Bizzarro, J.J. W.D. Smith, R.E. Hueter, J.Tyminski, J.F. Marquez-Farias, J.L. Castillo-Geniz, G.M. Cailliet and C.J. Villavicencio-Garayzar. The status of shark and ray fishery resources in the Gulf of California: applied research to improve management and conservation. Moss Landing Marine Laboratories Tech. Pub. 2009-01:238 pp. 2007. Bizzarro, J.J., W.D. Smith, J.F. Marquez-Farıas and R.E. Hueter. Artisanal fisheries and reproductive biology of the golden cownose ray, Rhinoptera steindachneri Evermann and Jenkins, 1891, in the northern Mexican Pacific. Fisheries Research 84:137-146. 2007. Collins, A.B., M.R. Heupel, R.E. Hueter and P.J. Motta. Hard prey specialists or opportunistic generalists? An examination of the diet of the cownose ray, Rhinoptera bonasus. Marine and Freshwater Research 58:135-144. 2007. Lowry, D., P.J. Motta and R.E. Hueter. The ontogeny of feeding behavior and cranial morphology in the leopard shark Triakis semifasciata (Girard 1854): a longitudinal perspective. Journal of Experimental Marine Biology and Ecology 341:153-167. 2006. Sasko, D.E., M.N. Dean, P.J. Motta and R.E. Hueter. Prey capture behavior and kinematics of the Atlantic cownose ray, Rhinoptera bonasus. Zoology 109:171-181. 2006. Hueter, R.E., C.A. Manire, J.P. Tyminski, J.M. Hoenig and D.A. Hepworth. Assessing mortality of released or discarded fish using a logistic model of relative survival derived from tagging data. Transactions of the American Fisheries Society 135:500-508. 2006. Hueter, R., R. de la Parra, J. Tyminski, M. Trigo Mendoza, C. Simpfendorfer, J. Gonzalez Cano, F. Remolina Suarez and J. Perez Ramirez. Biological studies of the whale shark aggregation off Isla Holbox and Isla Contoy, where the Gulf of Mexico meets the Caribbean Sea. 59th Annual Gulf and Caribbean Fisheries Institute, Belize City, Belize:89-90. 2005. Matott, M.P., P.J. Motta and R.E. Hueter. Modulation in feeding kinematics and motor patterns of the nurse shark Ginglymostoma cirratum. Environmental Biology of Fishes 74:163-174. 2005. Huber, D.R., T.G. Eason, R.E. Hueter and P.J. Motta. Analysis of the bite force and mechanical design of the feeding mechanism of the durophagous horn shark Heterodontus francisci. Journal of Experimental Biology 208:3553-3571. 2005. Keeney, D.B., M.R. Heupel, R.E. Hueter and E.J. Heist. Microsatellite and mitochondrial DNA analyses of the genetic structure of blacktip shark (Carcharhinus limbatus) nurseries in the northwestern Atlantic, Gulf of Mexico, and Caribbean Sea. Molecular Ecology 14:1911-1923. 2005. Hueter, R.E., Heupel, M.R., E.J. Heist and D.B. Keeney. Evidence of philopatry in sharks and implications for the management of shark fisheries. Journal of Northwest Atlantic Fishery Science 35:239-247. 2005. Hueter, R., J. Gonzalez-Cano, R. de la Parra, J. Tyminski, J. Perez-Ramirez and F. Remolina-Suarez . Biological studies of large feeding aggregations of whale sharks (Rhincodon typus) in the southern Gulf of Mexico. International Whale Shark Conference, Perth, Western Australia:29. 2005. Hueter, R., J. Gonzalez Cano, F. Remolina Suarez, R. de la Parra, J. Tyminski and J. Perez Ramirez. Whale shark summer feeding grounds where the Gulf of Mexico meets the Caribbean Sea., 21st Annual Meeting of the American Elasmobranch Society / Joint Meeting of Ichthyologists & Herpetologists, Tampa, Florida. 2005. Tyminski, J.P., R.E. Hueter and C.A. Simpfendorfer. Relative abundance and long-term movement patterns of juvenile blacktip sharks, Carcharhinus limbatus, in three Florida Gulf coastal nursery areas, 1995-2004. 21st Annual Meeting of the American Elasmobranch Society / Joint Meeting of Ichthyologists & Herpetologists, Tampa, Florida. 2005. Tyminski, J., C. Simpfendorfer and R. Hueter. Results of Mote Shark Tagging Program for blacktip (Carcharhinus limbatus) and sandbar (C. plumbeus) sharks. SEDAR 11-DW-44. 2005. Simpfendorfer, C., J. Tyminski, and R. Hueter. Large coastal shark surveys in eastern Gulf of Mexico, 2001–2004. SEDAR LCS05/06-DW-43. 2004. Smith, M., D. Warmolts, D. Thoney and R. Hueter (eds.). The Elasmobranch Husbandry Manual: Captive Care of Sharks, Rays and their Relatives. Special Publ., Ohio Biolog. Survey, xv+ 589 p.
2004. Hueter, R.E., Heupel, M.R., E.J. Heist and D.B. Keeney. Evidence of philopatry in sharks and implications for the management of shark fisheries. e-Journal of Northwest Atlantic Fishery Science 35, art. 7 (http://journal.nafo.int/35/7-hueter.html). 2004. Heupel, M.R., C.A. Simpfendorfer and R.E. Hueter. Estimation of shark home ranges using passive monitoring techniques. Environmental Biology of Fishes 71:135-142. 2004. Hueter, R.E., D.A. Mann, K.P. Maruska, J.A. Sisneros and L.S. Demski. Sensory biology of elasmobranchs. In Biology of Sharks and their Relatives, J. Carrier, J. Musick and M. Heithaus, eds. CRC Press, Boca Raton, Florida, p. 325-368. 2004. Hueter, R.E., J. Gonzalez Cano, F. Remolina Suarez and J. Tyminski. Studies of an exceptionally large feeding aggregation of whale sharks (Rhincodon typus) off Quintana Roo, Mexico. 8th European Elasmobranch Association Conference, London UK. 2004. Heupel, M.R. and R.E. Hueter. Sharks and satellite tagging: achieving the potential. Workshop Report April 2004 submitted to NOAA/NMFS. MML Technical Report No. 962. 2004. Hueter, R. Highly Migratory Shark Fisheries Research by the National Shark Research Consortium. Semi-Annual Performance Report submitted January 2004 to NOAA/NMFS. MML Technical Report No. 946. 2004. Hueter, R. Highly Migratory Shark Fisheries Research by the National Shark Research Consortium. Semi-Annual Report submitted July 2004 to NOAA/NMFS. MML Tech. Rpt. 1002. 2004. Hueter, R. Cooperative Shark and Ray Research in the Southeast Region by the Center for Shark Research, 2001-2003. Final Report submitted to NOAA/NMFS. MML Tech.Report.954. 2003. Heupel, M.R., C.A. Simpfendorfer and R.E. Hueter. Running before the storm: blacktip sharks respond to falling barometric pressure associated with Tropical Storm Gabrielle. Journal of Fish Biology 63:1357-1363. 2003. Keeney, D.B., M.R. Heupel, R.E. Hueter and E.J. Heist. Genetic heterogeneity among blacktip shark, Carcharhinus limbatus, continental nurseries along the U.S. Atlantic and Gulf of Mexico. Marine Biology 143:1039-1046. 2003. Heupel, M.R., C.E. Simpfendorfer, and R.E. Hueter. Use of passive acoustic telemetry to examine the utilization of a coastal nursery ground by blacktip sharks. 17th International Society on Biotelemetry Meeting, Brisbane, Australia. 2003. Hueter, R.E., J.L. Castillo-Geniz, J.F. Marquez-Farias, J.P. Tyminski. The role of Laguna Yalahau, Quintana Roo, Mexico as a primary nursery area for the blacktip shark (Carcharhinus limbatus). I Foro de Intercambio Cientifico Sobre Tiburones y Rayas, Guaymas, Sonora, Mexico. 2003. Hueter, R., J. Tyminski, G. Cailliet, J. Bizzarro, W. Smith, F. Marquez-Farias, L. Castillo-Geniz, and C. Villavicencio-Garayzar. Results of a two-year survey of Mexican artisanal fisheries targeting sharks, skates and rays in the Gulf of California. American Fisheries Society Western Division and California-Nevada Chapter Joint Annual Meeting. San Diego, CA. 2003. Hueter, R.E., J.P. Tyminski, J.L. Castillo-Geniz, and J.F. Marquez-Farias. Investigations of a primary nursery area for the blacktip shark, Carcharhinus limbatus, in Quintana Roo, Mexico. 19th Annual Meeting of the American Elasmobranch Society / Joint Meeting of Ichthyologists & Herpetologists, Manaus, Brazil. 2003. Keeny, D.B., Heupel, M.R., Hueter, R.E. and Heist, E.J. Phylogeography of the blacktip shark, Carcharhinus limbatus, based upon mitochondrial control region sequences. 19th Annual Meeting of the American Elasmobranch Society / Joint Meeting of Ichthyologists & Herpetologists, Manaus, Brazil. 2003. Hueter, R.E. Life History, Essential Habitat and Stock Assessment of Highly Migratory Sharks in U.S. and Mexican Waters: Fisheries Research by the Center for Shark Research, 2001-2002. Final Report for NOAA/NMFS Grant NA 16FM1658. Mote Technical Report No. 913. 2002. Heupel, M.R. and R.E. Hueter. Importance of prey density in relation to the movement patterns of juvenile blacktip sharks (Carcharhinus limbatus) within a coastal nursery area. Marine and Freshwater Research 53:543-550. 2002. Hueter, R.E., M.R. Heupel, E.J. Heist and D.B. Keeney. The implications of philopatry in sharks for the management of shark fisheries. Northwest Atlantic Fisheries Organization Research Document SCR Doc. 02/122:1-9. 2002. Motta, P.J., R.E. Hueter, T.C. Tricas and A.P. Summers. Kinematic analysis of suction feeding in the nurse shark, Ginglymostoma cirratum (Orectolobiformes, Ginglymostomatidae). Copeia 2002:24-38. 2002. Simpfendorfer, C.A., M.R. Heupel and R.E. Hueter. Estimation of short-term centers of activity from an array of omnidirectional hydrophones and its use in studying animal movements. Canadian Journal of Fisheries and Aquatic Sciences 59:23-32. 2002. Simpfendorfer, C.A., R.E. Hueter, U. Bergman and S.M.H. Connett. Results of a fishery-independent survey for pelagic sharks in the western North Atlantic, 1977-1994. Fisheries Research 55:175-192. 2002. Heupel, M.R. and R.E. Hueter. Observation of philopatric behaviors in juvenile blacktip sharks. 18th Annual Meeting of the American Elasmobranch Society / Joint Meeting of Ichthyologists & Herpetologists, Kansas City, Missouri. 2002. Keeny, D.B., M.R. Heupel, R.E. Hueter and E.J. Heist. Investigation of female philopatry and stock structure among blacktip shark nurseries using mitochondrial haplotypes and microsatellites. 18th Annual Meeting of the American Elasmobranch Society / Joint Meeting of Ichthyologists & Herpetologists, Kansas City, Missouri. 2002. Heupel, M.R. and R.E. Hueter. Use of acoustic telemetry to passively monitor long-term movements of blacktip sharks. American Fisheries Society annual meeting abstracts, Baltimore, Maryland, August 18-22. 2002. Keeny, D.B., M.R. Heupel, R.E. Hueter and E.J. Heist. Genetic structure of blacktip shark continental nurseries based upon mitochondrial control region haplotypes and microsatellite loci. American Fisheries Society annual meeting abstracts, Baltimore, Maryland, August 18-22. 2002. Heupel, M.R. and R.E. Hueter. Passively monitoring the long-term movements of blacktip sharks in a nursery area. European Elasmobranch Association annual meeting abstracts, Cardiff, Wales, September 6-8. 2002. Heupel, M.R., C.A. Simpfendorfer and R.E. Hueter. Direct estimation of survival and mortality of juvenile blacktip sharks, Carcharhinus limbatus, using telemetry data. Elasmobranch Fisheries Symposium, Northwest Atlantic Fisheries Organization annual meeting abstracts, Santiago de Compostela, Spain, September 11-13. 2002. Hueter, R.E. The Center for Shark Research at Mote Marine Laboratory: mission, staff, activities and accomplishments. European Elasmobranch Association annual meeting abstracts, Cardiff, Wales, September 6-8. 2002. Hueter, R.E., M.R. Heupel, E.J. Heist and D.B. Keeney. The implications of philopatry in sharks for the management of shark fisheries. Elasmobranch Fisheries Symposium, Northwest Atlantic Fisheries Organization annual meeting abstracts, Santiago de Compostela, Spain, Sept 11-13. 2002. Hueter, R.E., J. Tyminski, G. Cailliet, J. Bizzarro, W. Smith,F. Marquez-Farias, L. Castillo-Geniz and C. Villavicencio-Garayzar. Artisanal fisheries for sharks, skates and rays in the Gulf of California. I Foro Cientifico de Pesca Riberena (First Scientific Forum on Coastal Fisheries) meeting abstracts, Guaymas, Mexico, October 17-18. 2002. Hueter, R.E., J. Tyminski, J. Gelsleichter, M.R. Heupel, C.A. Simpfendorfer. Florida Gulf coast shark nursery essential fish habitat: distribution, dynamics, environmental quality and management benefits. American Fisheries Society annual mtg., Baltimore, MD, August 18-22. 2002. Hueter, R.E. and J.P. Tyminski. U.S. Shark Nursery Research Overview, Center for Shark Research, Mote Marine Laboratory 1991-2001. Final Report submitted to NOAA/NMFS, Narragansett, RI. Mote Marine Laboratory Technical Report No. 816. 2001. Wilga, C.D., R.E. Hueter, P.C. Wainwright and P.J. Motta. Evolution of upper jaw protrusion mechanisms in elasmobranchs. American Zoologist 41:1248-1257. 2001. Heupel, M.R. and R.E. Hueter. Use of an automated acoustic telemetry system to passively track juvenile blacktip shark movements. In Electronic Tagging and Tracking in Marine Fisheries (J.R. Sibert and J.L.Nielsen, eds. ), pp. 217-236. Kluwer Acad. Publ., Netherlands. 2001. Hueter, R.E. Historical perspectives: Perry W. Gilbert. Copeia 2001(1):279-284. 2001. Hueter, R.E., C.J. Murphy, M. Howland, J.G. Sivak, J.R. Paul-Murphy and H.C. Howland. Refractive state and accommodation in the eyes of free-swimming vs. restrained juvenile lemon sharks (Negaprion brevirostris). Vision Research 41:1885-1889. 2001. Pretlow-Edmonds, M.A., P.J. Motta and R.E. Hueter. Food capture kinematics of the suction feeding horn shark, Heterodontus francisci. Environmental Biology of Fishes 62:415-427.
capture and restraint in three species of sharks. Trans. Amer. Fisheries Soc. 130:1038-1048. 2001. Tyminski, J.P., C.A. Simpfendorfer, C.A. Manire, and R.E. Hueter. Growth rates of bonnethead sharks, Sphyrna tiburo, from the west coast of Florida estimated from tag-recapture data. 17th Annual Meeting of the American Elasmobranch Society / Joint Meeting of Icthyologists & Herpetologists, University Park, Pennsylvania. 2000. Oliver, L.J., M. Salmon, J. Wyneken, R. Hueter and T.W. Cronin. Retinal anatomy of hatchling sea turtles: anatomical specializations and behavioral correlates. Marine and Freshwater Behaviour and Physiology 33:233-248. 2000. Hueter, R.E., G.M. Cailliet, J.F. Marquez Farias, J.L. Castillo Geniz and C.J. Villavicencio Garayzar. Artisanal fisheries for elasmobranchs in the Gulf of California: a multi-institutional project. American Elas. Soc./American Soc. of Ichs. & Herps. Ann. Mtg. Abs.:203. 2000. Marquez Farias, J.F., J.T. Tyminski, R.E. Hueter, P.M. Sanchez, A. Landa Ocana, E. Gonzalez Corona and Z. Mijangos Alquisires. The artisanal elasmobranch fishery in Sonora. 16th Annual Meeting of the American Elasmobranch Society / Joint Meeting of Ichthyologists & Herpetologists, La Paz, Baja California Sur, Mexico. 2000. Heupel, M.R. and R.E. Hueter. Patterns of movement by neonate blacktip sharks, Carcharhinus limbatus, within a coastal nursery area. 16th Annual Meeting of the American Elasmobranch Society / Joint Meeting of Ichthyologists & Herpetologists, La Paz, Baja California Sur, Mexico. 2000. Hepworth, D.A., R.E. Hueter, C.A. Manire and J.M. Hoenig. Assessing post-release mortality of coastal sharks using a logistic model of relative survival. 16th Annual Meeting of the American Elasmobranch Society / Joint Meeting of Ichthyologists & Herpetologists, La Paz, Baja California Sur, Mexico. 2000. C. Simpfendorfer, U. Bergman, S. Connett and R. Hueter. Estimation of changes in the relative abundance of pelagic sharks in the northwestern Atlantic based on data from a fishery-independent survey. Intl. Pelagic Shark Workshop (Feb 14-17, 2000, Pacific Grove, CA) Abs.:18. 1999. Bergman, U., S. Connett, C. Simpfendorfer and R. Hueter. A remarkably consistent fishery-independent measure of the relative abundance of large coastal and pelagic shark species inhabiting the northwestern Atlantic, 1976-1994. 15th Annual Meeting of the American Elasmobranch Society / Joint Meeting of Ichthyologists & Herpetologists, University Park, Pennsylvania. 1999. Haenni, E.G., J.P. Wourms, C.A. Manire and R.E. Hueter. Embryological development of the cephalofoil in the bonnethead shark, Sphyrna tiburo. 15th Annual Meeting of the American Elasmobranch Society / Joint Meeting of Ichthyologists & Herpetologists, University Park, Pennsylvania. 1999. Smith, W.D., J.J. Bizzarro, E.M. Jones, J.A. Neer, J. Tyminski, J.F. Marquez-Farias, G.M. Cailliet and R.E. Hueter. A preliminary assessment of the elasmobranch fishery in the northern Gulf of California, Mexico. 15th Annual Meeting of the American Elasmobranch Society / Joint Meeting of Ichthyologists & Herpetologists, University Park, Pennsylvania. daily ration in the bonnethead shark, Sphyrna tiburo. 15th Annual Meeting of the American Elasmobranch Society / Joint Meeting of Ichthyologists & Herpetologists, University Park, Pennsylvania. 1999. Hueter, R.E., G.M. Cailliet, C.J. Villavicencio-Garayzar, J.L. Castillo-Geniz, and J.F. Marquez-Farias. Current status of shark and ray artisanal fisheries in the Gulf of California: a multi-institutional project. VII Congress of the Association of Investigators of the Sea of Cortez and First International Symposium on the Sea of Cortez Mtg. Abs.:77. 1999. Marquez-Farias, J.F., J. Tyminski, R.E. Hueter, J.L. Castillo-Geniz, and C. Murillo. Diversity of harvested elasmobranchs in Sonora as determined from a survey of the artisanal fishery. VII Congress of the Association of Investigators of the Sea of Cortez and First International Symposium on the Sea of Cortez Mtg. Abs.:75. 1999. Smith, W.D., J.J. Bizzarro, E.M. Jones, J.A. Neer, J. Tyminski, J.F. Marquez-Farias, G.M. Cailliet and R.E. Hueter. Preliminary assessment of the elasmobranch fishery in the northern Gulf of California, Mexico. VII Congress of the Association of Investigators of the Sea of Cortez and First International Symposium on the Sea of Cortez Mtg. Abs.:202. 1999. Hueter, R.E. Early life history and relative abundance of blacktip and other coastal sharks in eastern Gulf of Mexico nursery areas, including bycatch mortality of sharks and associated fishes. Final report to NOAA/NMFS Southeast Regional Office, Cooperative Programs Division, St. Petersburg, FL. Mote Marine Laboratory Technical Report No. 630. 1999. Hueter, R.E. The status of shark and ray fishery resources in the Gulf of California: applied research to improve conservation and management. Report to National Fish and Wildlife Foundation. Mote Marine Laboratory Technical Report No. 628. 1999. Hueter, R.E. Center for Shark Research at Mote Marine Laboratory, 1997-1998. Final report to NOAA/NMFS Southeast Regional Office, Cooperative Programs Division, St. Petersburg, FL. Mote Marine Laboratory Technical Report No. 636. 1998. Hueter, R.E. (ed.). Science and Management of Shark Fisheries. Fisheries Res. 39:105-228. 1998. Hueter, R.E. Science and management of shark fisheries – Introduction. Fisheries Res. 39:105. 1998. Hueter, R.E. Philopatry, natal homing and localised stock depletion in sharks.Shark News 12:1-2. 1998. Gruber, S.H. and R.E. Hueter. Sensory biology of vision in the elasmobranchs. 14th Annual Meeting of the American Elasmobranch Society / Joint Meeting of Ichthyologists & Herpetologists, Guelph, Ontario, Canada. of oxytetracycline on growth of captive nurse sharks, Ginglymostoma cirratum. Fishery Bulletin 96:624-627. 1998. Hueter, R.E. Great White Sharks: The Biology of Carcharodon carcharias (book review). Quarterly Review of Biology 73:82. 1997. Motta, P.J., Tricas, T.C., Hueter, R.E. and A.P. Summers. Feeding mechanism and functional morphology of the jaws of the lemon shark Negaprion brevirostris (Chondrichthyes, Carcharhinidae). Journal of Experimental Biology 200:2765-2780. 1997. Gelsleichter, J.G., E. Cortés, C.A. Manire, R.E. Hueter and J.A. Musick. Use of calcein as a fluorescent marker for elasmobranch vertebral cartilage. Trans. Amer. Fish. Soc. 126:862-865. 1997. Hueter, R.E. Philopatry, natal homing and localized stock depletion in sharks: strictly a hypothesis. 13th Annual Meeting of the American Elasmobranch Society / Joint Meeting of Ichthyologists & Herpetologists, Seattle, Washington. 1997. Hueter, R.E., C.A. Manire, L. Trent and T.J. Cody. Shark nurseries in coastal waters of the Gulf of Mexico. American Fisheries Society Ann. Mtg. Abs. : P-18. 1997. Hueter, R.E. Early life history and relative abundance of blacktip and other coastal sharks in eastern Gulf of Mexico nursery areas, including bycatch mortality of sharks and associated fishes. NOAA/NMFS/MARFIN Program annual meeting abstracts. 1996. Hueter, R.E. Catch/tag-and-release: the conservation option for recreational shark fishermen. Shark News 7:7. 1996. Cortés, E., C.A. Manire and R.E. Hueter. Diet, feeding habits and diel feeding chronology of the bonnethead shark, Sphyrna tiburo, in southwest Florida. Bulletin of Marine Science 58:353-367. 1996. Hueter, R.E., C.A. Manire, L. Castillo-Géniz, F. Márquez-Farias and E. Cortés. Distribution and movements of juvenile sharks in coastal waters of the Gulf of Mexico. 12th Annual Meeting of the American Elasmobranch Society / Joint Meeting of Ichthyologists & Herpetologists, New Orleans, Louisiana. 1996. Hueter, R.E. Shark sense: scent, sight & sound. The Edge - Big Game Fishing Journal 9:46-57. 1995. Manire, C.A., L.E.L. Rasmussen, D.L. Hess and R.E. Hueter. Serum steroid hormones and the reproductive cycle of the female bonnethead shark, Sphyrna tiburo. General and Comparative Endocrinology 97:366-376. 1995. Hueter, R., C. Manire, L. Trent and L. Castillo-Géniz. Life and death in shark nursery areas of the Gulf of Mexico. American Fisheries Society Ann. Mtg. Abs.:127. 1995. Hueter, R.E. 1993 Southwest Florida Gulf Coast Shark Census. Mote Marine Laboratory Technical Report No. 408 (Final report to NOAA/NMFS, S-K Project NA37FD0086-01):113 pp. 1995. Motta, P.J., T.C. Tricas, R.E. Hueter and A.P. Summers. Feeding mechanics of the lemon shark: conservative motor and kinematic patterns. American Zoologist 35(5):103A. 1995. Sherman, R.L., C.A. Nelson, R. Hueter and R.E. Spieler. Preliminary examination of gill surface area in two batoid elasmobranchs. American Zoologist 35(5):118A. 1995. Manire, C.A. and R.E. Hueter. Human impact on the shark nursery grounds of Tampa Bay. Florida Scientist 58(2):107. 1994. Hull, E., C. Manire, R. Hueter and R. Spieler. Changes in blood parameters in stressed sharks due to capture and restraint. American Zoologist 34(5):36A. 1994. Hueter, R.E. The Great White Shark (book review). Copeia 1994:1057-1058. 1994. Hueter, R.E. The American Elasmobranch Society. Fisheries 19:40. 1994. Hueter, R.E. and C.A. Manire. Bycatch and catch-release mortality of small sharks in the Gulf coast nursery grounds of Tampa Bay and Charlotte Harbor. Mote Marine Laboratory Technical Report No. 368 (Final report to NOAA/NMFS, MARFIN Project NA17FF0378-01):183 pp. 1994. Hueter, R.E. and C.A. Manire. Bycatch and catch-release mortality of small sharks and associated fishes in the estuarine nursery grounds of Tampa Bay and Charlotte Harbor. Mote Marine Laboratory Tech. Rept. No. 367 (Final report to Florida DEP, Project 7237/7849):181 pp. 1994. Hueter, R.E., C.A. Manire and M.R. Friday. Shark nurseries of the eastern Gulf of Mexico: biology and fisheries-related mortality of juvenile sharks in Tampa Bay and Charlotte Harbor, Florida. 10th Annual Meeting of the American Elasmobranch Society / Joint Meeting of Ichthyologists & Herpetologists, Los Angeles, California. 1994. Hueter, R.E., C.J. Murphy, H.C. Howland and M. Howland. Dynamic refractive state and accommodation in the eyes of free-swimming vs. restrained lemon sharks (Negaprion brevirostris). 10th Annual Meeting of the American Elasmobranch Society / Joint Meeting of Ichthyologists & Herpetologists, Los Angeles, California. 1993. Hueter, R.E. Elasmobranchs (and all other organisms) as biotic resources. 9th Annual Meeting of the American Elasmobranch Society / Joint Meeting of Ichthyologists & Herpetologists, Austin, Texas. 1993. Manire, C.A. and R.E. Hueter. Human impact on the shark nursery grounds of Tampa Bay. Florida Scientist 56(Suppl. 1):27. 1993. Manire, C.A. and R.E. Hueter. Distribution and seasonal movements of sharks in Tampa Bay and Charlotte Harbor, Florida. 9th Annual Meeting of the American Elasmobranch Society / Joint Meeting of Ichthyologists & Herpetologists, Austin, Texas..
1992. Gruber, S.H. and R.E. Hueter. The ecomorphology of vision in sharks. 8th Annual Meeting of the American Elasmobranch Society / Joint Meeting of Ichthyologists & Herpetologists, Champaign-Urbana, Illinois. 1992. Hueter, R.E., S.J. Zeiner and R.S. DesRochers. Tagging small sharks in the estuarine nursery grounds of Tampa Bay and Charlotte Harbor, Florida. 8th Annual Meeting of the American Elasmobranch Society / Joint Meeting of Ichthyologists & Herpetologists, Champaign-Urbana, Illinois. 1991. Hueter, R.E. Survey of the Florida recreational shark fishery utilizing shark tournament and selected longline data. Mote Marine Laboratory Technical Report 232A (Final report to Florida DNR, Project 6627):94 pp. 1991. Hueter, R.E. The rise and fall of recreational "kill" tournaments for sharks in Florida: historical trends, research potential, and the conservation movement. Journal of Australian Marine and Freshwater Research, Sharks Down Under Conference, Sydney, Australia. 1991. Motta, P.J., R.E. Hueter and T.C. Tricas. An electromyographic analysis of the biting mechanism of the lemon shark, Negaprion brevirostris: functional and evolutionary implications. Journal of Morphology 210:55-69. 1991. Hueter, R.E. Adaptations for spatial vision in sharks. J. Experimental Zoology Suppl. 5:130-141. 1991. Hueter, R.E. and P.W. Gilbert. The sensory world of sharks. Underwater Naturalist 19/20:48-55. 1991. Gruber, S.H., ed. Discovering Sharks (J. Carrier, R. Hueter and S. Moss, scientific eds.). American Littoral Society Special Pub. 14:122 pp. American Littoral Society, Highlands, NJ. 1991. Hueter, R.E. Sportfishing tournaments for sharks in Florida, 1975-1990. 7th Annual Meeting of the American Elasmobranch Society / Joint Meeting of Ichthyologists & Herpetologists, New York, New York. 1990. Hueter, R.E. and J.L. Cohen, eds. Vision in Elasmobranchs: A Comparative and Ecological Perspective. Journal of Experimental Zoology Supp. 5:1-182. 1989. Hueter, R.E., J.L. Cohen and D.T. Organisciak. Visual sensitivity in juvenile vs. adult lemon sharks: a mismatch resolved. 6th Annual Meeting of the American Elasmobranch Society / Joint Meeting of Ichthyologists & Herpetologists, San Francisco, California. 1988. Hueter, R.E. Retinotectal projection, retinal topography, and implications for the visual ecology of the juvenile lemon shark (Negaprion brevirostris). 5th Annual Meeting of the American Elasmobranch Society / Joint Meeting of Ichthyologists & Herpetologists, Ann Arbor, Michigan. 1988. Hueter, R.E. The organization of spatial vision in the juvenile lemon shark (Negaprion brevirostris): retinotectal projection, retinal topography, and implications for the visual ecology of sharks. Ph.D. dissertation, University of Florida, Gainesville, Florida. 130pp. 1982. Hueter, R.E. and S.H. Gruber. Recent advances in studies of the visual system of the juvenile lemon shark (Negaprion brevirostris). Florida Scientist 45:11-25. 1980. Hueter, R.E. Physiological optics of the eye of the juvenile lemon shark (Negaprion brevirostris). M.S. thesis, University of Miami, Coral Gables, Florida. 145pp.